Available in three configurations, Apple’s new iBook G4 series of notebooks targets a more cost-conscious market than its flagship portable computer, the stunning PowerBook. 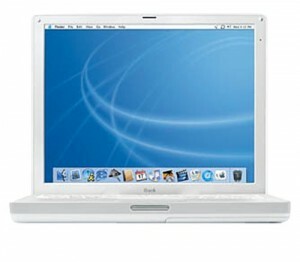 This model, the iBook G4 14-inch M9165LL/A, is the top of the current iBook line. Though it doesn’t feature upscale PowerBook amenities such as a DVD burner or widescreen display, it is powerful, compact, and impressively battery efficient. And, like all Apple notebooks, it’s very well connected. Featuring a nimble power section consisting of a 1 GHz PowerPC G4 processor, 256 MB RAM (expandable to 640 MB) and an ATI Mobility Radeon 9200 video chipset with 32 MB of dedicated DDR SDRAM memory, the system packs enough raw muscle for most typical mobile computing tasks including some 3-D applications such as midlevel games, graphic design and drawing packages. At just 12.7 by 10.2 by 1.35 inches and 5.9 pounds, the iBook G4 14-inch M9165LL/A is a pound heavier and a few square inches larger than its close cousin, the entry-level iBook G4 12-inch M9164LL/A. Nevertheless, it’s smaller and more portable than many competing notebooks. Furthermore, this unit features a larger viewing screen than the 12-inch model, a 14.1-inch TFT XGA active-matrix display capable of 1024×768 resolution. It also features a substantially larger hard disk than any of the new iBooks, a 60 GB drive that’s spacious enough for a typical roster of applications and a small library of multimedia and music files. Furthermore, Apple has added a combination CD-RW/DVD-ROM drive through which you can burn audio CDs, archive files and play the latest Hollywood blockbusters. Connectivity options include an integrated 56K modem for dial-up communications, a 10/100BASE-T Ethernet port for LAN and high-speed Internet and email, and two high-speed USB 2.0 ports and one FireWire 400 port for external high-tech toys such as scanners, digital cameras and digital camcorders. Users can also purchase an Apple AirPort Extreme Card for wireless communication and an internal Bluetooth module to interact with future cordless Bluetooth devices such as cell phones and PDAs. MacBiz.com is a participant in the Amazon Services LLC Associates Program, an affiliate advertising program designed to provide a means for sites to earn advertising fees by advertising and linking to Amazon. Certain content that appears on MacBiz.com comes from Amazon Services LLC. This content is provided 'as is' and is subject to change or removal at any time.